This week I was attending another congress, the Continental European Cochrane Entities Meeting (CECEM). This annual meeting is meant for staff from Cochrane Entities, thus Centre Staff, RGC’s (Review Group Coordinators), TSC’s (Trial Search Coordinators) and other staff members of the Cochrane Collaboration based in Continental Europe. CECEM 2009 was held in Maastricht, the beautiful old Roman city in the South of the Netherlands. The city where my father was born and where I spend many holidays. David began with saying that the end user is really the key person and that the impact of the Cochrane Reviews is most important. 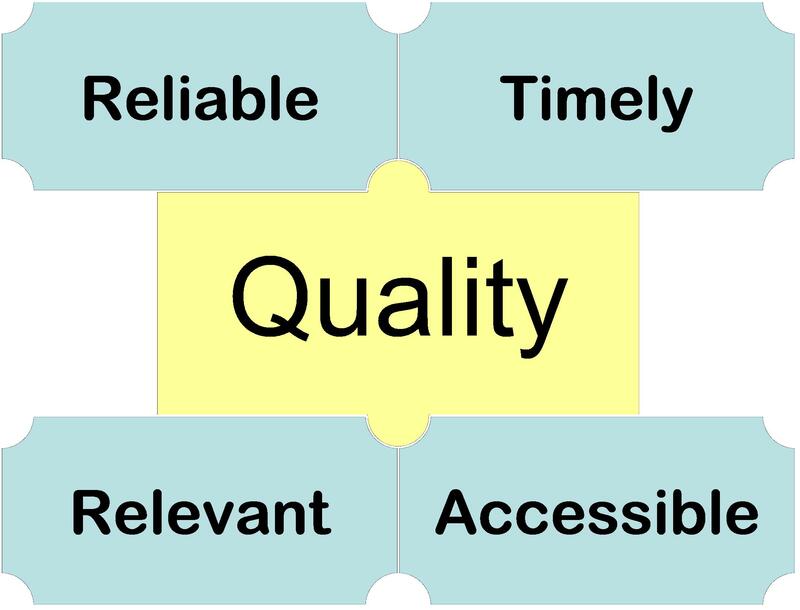 Quality is central, but quality depends on four pillars. Cochrane reviews should be reliable, timely, relevant and accessible. How quality is perceived is dependent on the end users. There are several kinds of end users, each with his own priorities. doctor: wants comprehensive and up-to-date info, wants to understand and get answers quickly. patient: trustworthiness, up-to-date, wants to be able to make sense of it. scientist: wants to see how the conclusions are derived. Timely: First it takes time to submit a title of a Cochrane Review and then it takes at least 2 years before a protocol becomes a review. Some reviews take even longer than 2 years. So there is room for improvement. Patients are also very important as end user. Strikingly, the systematic review about the use of cranberry to prevent recurrent urinary tract infection is the most frequently viewed article,- and this is not because the doctors are most interested in this particular treatment…. 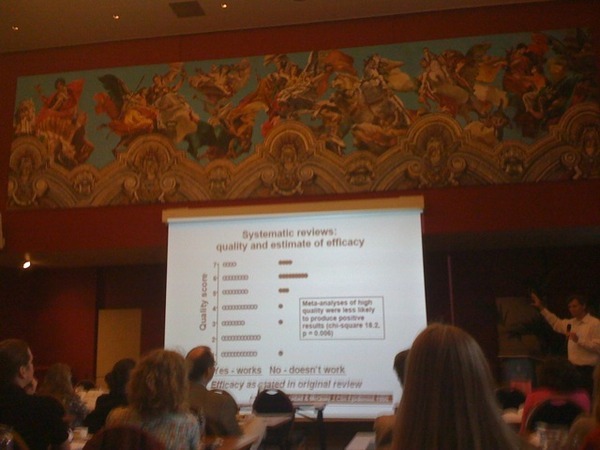 podcasts of systematic reviews (very successful till now), .e. see an earlier post. make clear what an update means and how important this update is: are there new studies found? are these likely to change conclusions or not? When was the last amendment to the search? I found the presentation very interesting. What I also liked is that David stayed with us for two days -also during the social program- and was easy approachable. I support the idea of a user-centric approach very much. However, I had expected the emphasis to be less on the timeliness (of updates for instance), but more on how users (patients, doctors) can get more involved and how we review the subjects that are most urgently needed. 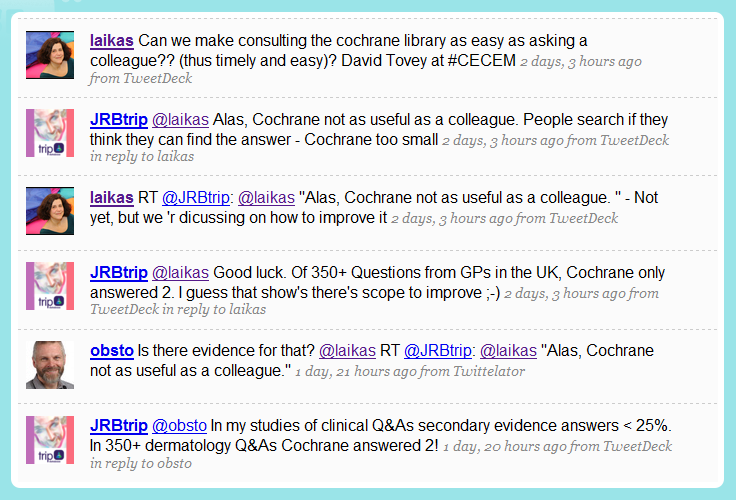 Indeed, when I twittered that Tovey suggested that we “make consulting the Cochrane Library as easy as asking a colleague”, Jon Brassey of TRIP answered that a lot has to be done to fulfill this, as the Cochrane only answers 2 out of 350+ questions asked by GPs in the UK, a statement that appeared to be based on his own experience (Jon is founder of the TRIP-database). But in principle I think that Jon is correct. Right now too few questions (in the field of interventions) are directly answered by Cochrane Systematic Reviews and too little is done to reach and involve the Cochrane Library users. During the CECEM other speakers addressed some of these issues in more detail. André Knottnerus, Chair of the Dutch Health Council, discussed “the impact of Cochrane Reviews”, and Rob the Bie of the Rehabilitation & Related Therapies field discussed “Bridging the gap between evidenced based practice and practice based evidence”, while Dave Brooker launched ideas about how to implement Web 2.0 tools. I hope to summarize these (and other) presentations in a blogpost later on. I had forgotten about this blank “citation” till this post was cited quite in another context (see comment: http://e-patients.net/archives/2009/11/tell-the-fda-the-whole-story-please.html) and someone commented that the asterisk to the “the amazing statement” had still to be looked up, indirectly arguing that this statement thus was not reliable- and continuing by giving an example of a typically flawed Cochrane Review that hit the headlines 4 years ago, a typical exception to the rule that “Cochrane systematic reviews are more reliable than other systematic reviews”. Of course when it is said that A is more trustworthy than B it is meant on average. I’m a searcher, and on average the Cochrane searchers are excellent, but when I do my best I surely can find some that are not good at all. Without doubt that also pertains to other parts of Cochrane Systematic Reviews. 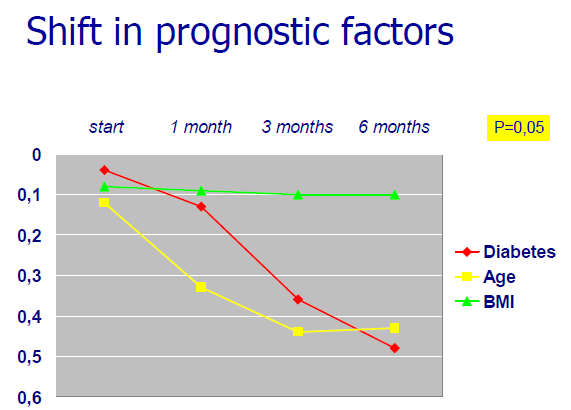 In addition -and that was the topic of the presentation- there is room for improvement. In previous posts I regularly discussed that (Merck’s Ghostwriters, Haunted Papers and Fake Elsevier Journals and One Third of the Clinical Cancer Studies Report Conflict of Interest) that pharma-sponsored trials rarely produce results that are unfavorable to the companies’ products [e.g. see here for an overview, and many papers of Lisa Bero]. I’m in Dublin to attend the EAHIL workshop 2009. The EAHIL is the European Association for Health Information and Libraries. The EAHIL -workshop 2009 really started Wednesday afternoon. Tuesday morning, as a foretaste of the official program I attended a Continuing Education Course, namely the Web 2.0 and Health Information course by Chris Mavergames. Chris Mavergames is currently the Web Operation Manager/Information Architect for the Cochrane Collaboration. Before, he worked in the field of information and library science. So Chris and I are really colleagues, but we didn’t realize until we “met” on Twitter. On this hot day in June I was pleased that the workshop was held in the cool Berkeley Library of Trinity College. They have chosen real good locations for this EAHIL workshop. Most presentations are in the Dublin Castle, another place at the Heart of the Irish History. The workshop took approximately 3 hours and consisted of two presentations, followed by short Q&A’s and an open forum afterwards. A case study of the experiences of implementing and using these technologies in a large, non-profit organization (Cochrane Collaboration). 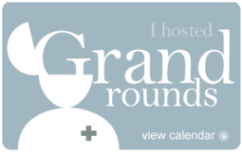 Eighteen people could attend. Each of us had a computer, which raised expectations that they were needed during the workshop. They were not, but they were handy anyway to look up things and to draft a post. And.. I could post this message on Twitter before Chris loaded a photo of his class on TwitPic. LOL. Chris began with asking the audience how many people either have used ..or at least have heard of Facebook, LinkedIn or any other social networking service. And then he asked which tools were being used. Afterwards he admitted he had checked everyone’s presence on various social bookmarking sites. Hilarious. To my surprise, quite a number of people were familiar with most of the web 2.0 services and sources. Indeed, weren’t librarians the first to embrace web 2.0? I got the impression Twitter was the least well known/appreciated tools. Most people were either on Facebook or Linkedin, not on both. This presumably has to do with separation of professional and personal things. Chris first explained the difference between Web 1.0 and Web 2.0: Web 1.0 is a one way interaction, static. Web 2.0 is: “more finding or receiving, less searching”. It has a dynamic aspect: there is more interaction, the possibility to ‘comment, subscribe, post, add, share or as Chris puts it: “Web 2.0 allows you to have information “pushed” at you vs. you having to “pull”. Another characteristic of web 2.0 is that technology has become easier. It is now more about content. 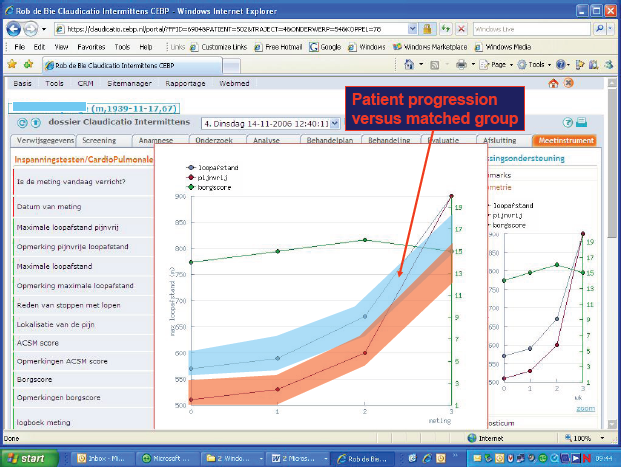 As an example he showed the Cochrane website from 2004 (web 1.0) and the current website. The first was just a plain web site where you could search, browse and email, the second has social bookmarking tools and is more dynamic and active: you can add comments, post on websites etc.. 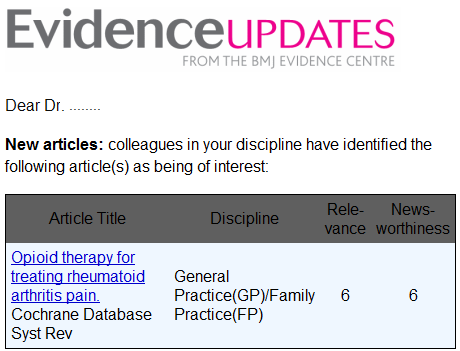 In addition the Cochrane Collaboration is now on Twitter and Facebook and produces podcasts of a selection of systematic reviews. 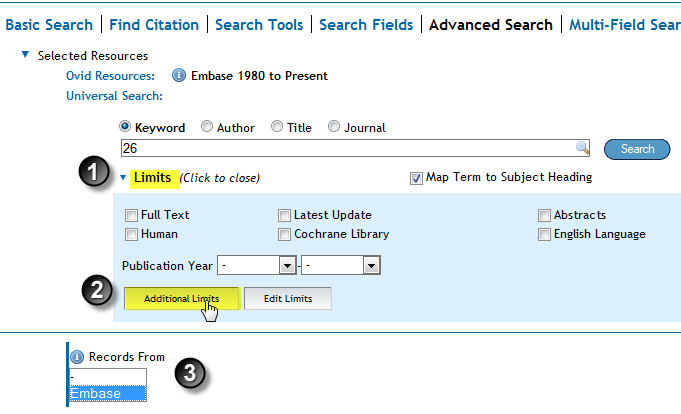 Another example of web 2.0 interfaces are MyNCBI of PubMed (for saving your searches) and i-Google. These services allow you to create an online profile so that you can interact with others, share and integrate. Examples are Facebook, LinkedIn and 2 Collab. What is used most, differs around the world. Linkedin is more a professional site, an “online resume” and Facebook is for more general stuff. “You’re mother is on facebook too, so..”. Most young people don’t realize what others can read. However, Facebook offers the possibility to select precisely who can see exactly what. It is as easy to subscribe to one’s updates as it is to unsubscribe. Chris uses Tweetdeck to filter for keywords that are of interest. But as he showed me later, he uses the i-phone to easily catch what people (he follows) are tweeting. Although Twitter was created as a social tool it is now much more than that. It creates a so called “ambient awareness” and as such it is a perfect example of “push” technology: you won‘t see every tweet, but you will l be ambiently aware of the conversation (of your “friends” or the subject you follow). Twitter is also very useful for getting a real fast answer to your question. This is how Chris learned the value of Twitter. He had a question at a meeting. Someone said: just put it on Twitter with the hashtag of the congress (an agreed upon keyword with #in front, like #EAHIL2009). He did it and within 3 minutes he got an answer. Twitter is also very useful for sharing and finding links. There are many “Twitter apps” around. Just search Google for it. For professional use within a company the twitter look-alike Yammer can be a useful alternative, because only people in the company are able to follow the updates. My personal experience is also very positive. Twitter and other web 2.0 tools can work synergistically, dependent on your Twitter community and how you use it. Although librarians aren’t always very happy with user generated tagging, social bookmarking tools are and easy way of allowing users to share a collections of links. Links used (directly or indirectly) for his presentation are available at del.icio.us/mavergames under the tag EAHIL. 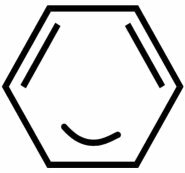 A blog can give a good summary of interesting articles in a particular field. Chris began a blog 2 months ago (http://mavergames.net) about a very specific subject he is involved in: Drupal. For him is it just an open notebook: a platform to share your ideas with others. It is possible receiving updates via RSS (push). Wiki’s are a very powerful knowledge gathering tool, a way to collaboratively create a resource, based on the principle of “Crowd sourcing” (The Wisdom of Crowds). Platforms can vary from Google Reader, Yahoo, Bloglines, but you can also use i-Google or a specilized medical page where you can find links to all kinds of sources, like blogs, podcasts and journals. Perssonalized Medicine (http://www.webicina.com/rss_feeds/) is especially recommended. Somebody from the audience added that Medworm is a good (and free) medical RSS feed provider as well. 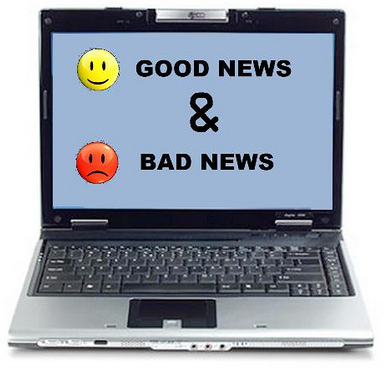 For an overview of several of such platforms, including Medworm, i-Google and www.webicina.com see an earlier post on this blog: Perssonalized Medicine and its alternatives (2009-02-27). 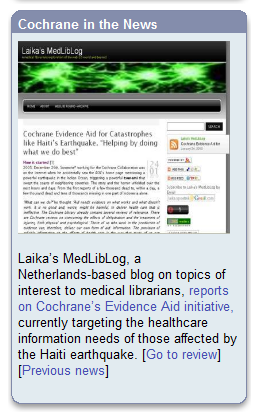 Chris visits Laika’s MedlibLog and reads Cochrane PodCasts are available. 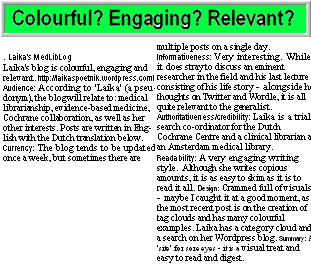 He finds it interesting , goes to the Cochrane website and subscribes to the Cochrane podcasts with RSS. He want to share this finding with others, so he decides to tweet that Cochrane podcasts are available. He gets a response: Hé do you know the Cochrane is on Facebook, so he visits Facebook, joins and posts the news on facebook again. And so on. Not only did Chris give a nice overview of Web 2.0 tools, but there was ample opportunity for discussions and remarks. The two most common questions were:  When can you find time for this? and  what can you do when the IT-departments don’t allow access to web 2.0 tools like YouTube, Facebook, RSS? 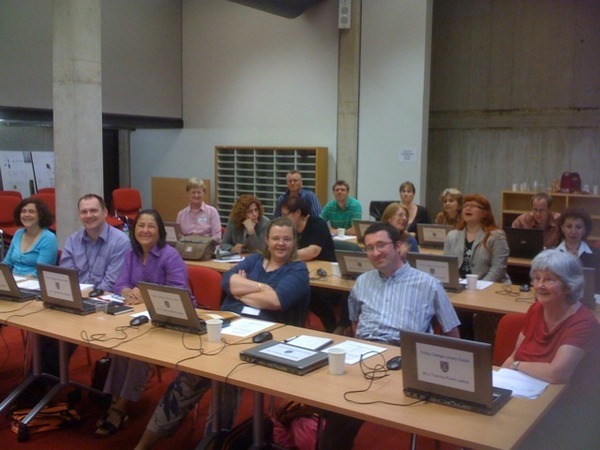 It really seamed the main barrier for librarians from many countries to the use of web 2.0. Nevertheless, Chris engaging presentation seemed to encourage many people to try the tools that were new to them at home. Afterwards I only heard positive comments on this workshop. The slidecasts of the two presentations are now online on http://www.slideshare.net/mavergames. The slidecast I’ve reviewed is below.